As you know, A Rack for Rocky started a few weeks ago. Today was the main day to WOD for Rocky. I know it may sound like a whole lot of CrossFit mumbo-jumbo, but it’s a pretty special gesture. I’m a little disappointed I didn’t complete the WOD myself, but it was a tough one, and I had the 15 km row looming over my head. The decision was made that I would row instead, and I am thankful to those who talked some sense into me. The WOD chosen (or created?) for today was ‘Nutter’. Are they trying to tell me something? A few comments were made that they would rather do Nutter than row 15 km. I was starting to think the same. As I inched towards the last 5 km I decided to tick off one of the other three challenges – WOD in your undies. So off came the top. There was no way I was going to row with just undies, so taking the top half off seemed a reasonable trade. I am the last person who would normally do such a thing, but hey, the girls only have another few days left. It was my last chance to show them off. After the WOD three others – Carmen, Darren and Nathan – completed ANOTHER challenge. CFWF breeds some pretty tough cookies. I was exhausted watching them. Mitch also completed his 2oo burpees next to me while I kept rowing. All of this activity around me distracted me from pain that was beginning to surface in my back, neck, groin, heel and thighs…pretty much everywhere. Also, for those who don’t know (and there is probably a lot of you who wouldn’t), our coach at CrossFit Western Front, Brandon is currently in the USA competing at the CrossFit Games. It’s a pretty big deal! A screen has been set up so we can watch the action live at the box. Unfortunately for me (and those cheering me on), I didn’t time things very well and was still rowing when he took the stage for his heat. I was grinding away on the rower while he was toughing it out with the world’s best CrossFitters. I think I had it easy. 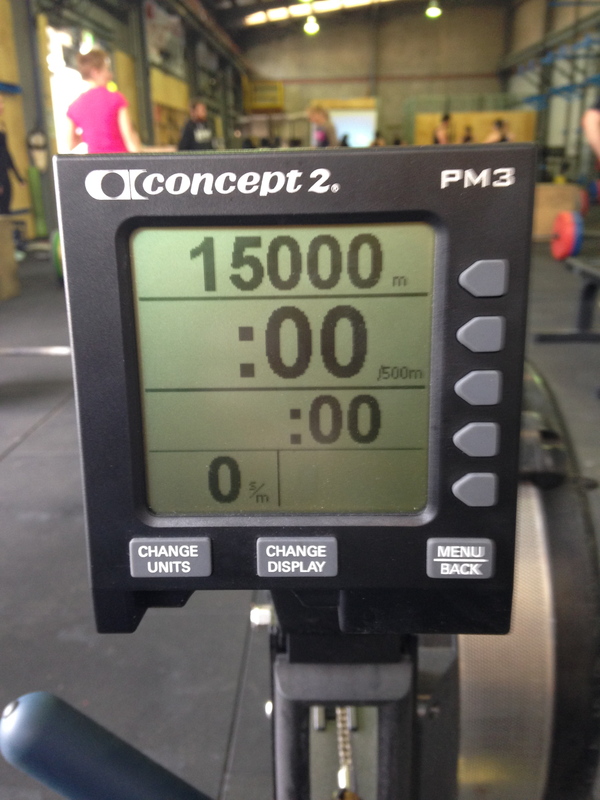 After 1 hr and 20-something minutes of rowing, I was finished. This fundraiser is quite daunting for me, in a good way. There are a lot of new (and old) CrossFitters at the box that probably don’t know me, or know me well. I find it pretty amazing how much everyone has embraced this challenge. I’ve been trying to keep track of everyone who has completed a challenge; it could qualify as a full-time job! There a lot of people to thank (and I will be thanking for a very long time!). Firstly, a massive thanks to everyone who has been involved in the logistics of this fundraiser! Lizzy, Brandon, Alex and Kate. Without the support of the owners and coaches at CFWF, this wouldn’t have be possible. Secondly, to everyone who has performed a burpee, rowed or been brave and bared more than normal. Paige – 2oo burpees, Alyce – 5 km row, Sara – WODed in her undies, Tenaya – 200 burpees, Olivia – 200 burpees, Russell (and his boys) – 200 burpees, Gavin – WODed in his undies, Alicia – 200 burpees, Bodie – 201 burpees, Jodie – 5 km row, Kelly – 200 burpees, Killah – 5 km row, Angie – 200 burpees, Darren – WODed in his undies (let’s clarify – a G-string and bra! ), Tim – WODed in his undies, Gina – 5 km row, Liz and Simon – 200 burpees each, Christina – WODed in her undies, Sam – 5 km row, Kirah – 200 burpees, Brad M – 200 burpees in his undies, undies that matched his shoes I should add! Shaun – 200 burpees, Nathan – 5 km row, Trent – 5 km row, Dan – 200 burpees in his undies, Kate – 5 km row, Dane – 200 burpees in his undies, Gail – 200 burpees, Cheryl – 5 km row, Jake – WODed in his undies, Brett – 200 burpees, Clint – 200 burpees in his undies, Dan M – 200 burpees, Andy – 200 burpees, Kayla – WODed in her undies, Stacey – 5 km row, Steph – 5 km row, Brad H – 5 km row, Tiff – 200 burpees, Louise – 5 km row, Tui – 5 km row, Mavis – 5 km row, Charlie – 200 burpees, Jessica – 200 burpees, Christine – 200 burpees, Kaylene – 200 burpees, Rachael – 5 km row, Wendy – 5 km row, Rachael – 5 km row, Moana – 5 km row, Carmen – 5 km row, Mitch – 2o0 burpees, Brayden – 5 km row, Renea – 5 km row, Ben – 5 km row, Paul – 200 burpees, Wendy – 5 km row, Amy – 200 burpees, Casey 400 burpees, James (El Phantasmo) 5 km row, Karla – 5 km row, Wendy – 5 km row. And David – I haven’t forgotten about you. David had to work and wasn’t able to complete his dare within the 48 hour period. Next on the list for me are 200 burpees. I want to complete all three challenges; it’s a small gesture to show how much I appreciate how involved everyone has been in this challenge and fundraiser. UPDATED: 27 July. The cost of surgery has been covered. This is a special blog for my CrossFit Western Front family. Some people in the fitness industry have issues with CrossFit. They think it’s a ‘cult’, or it’s not a safe workout environment: amateurs doing Olympic movements. I personally have not seen any of this in my eight months at CFWF. What I have seen, and become part of, is an immense sense of community. When I joined CFWF I was new to Ipswich. I say new because I hadn’t lived here for 13 years. The people I did know were friends from my younger years, and I was getting to know all over again, as an adult. I remember my first few sessions at CFWF, I was blown away by how friendly, approachable and helpful everyone was. I tried to hide away at the back each class but it didn’t stop everyone from showing support and ensuring I knew what I had to do. As I became friends with more individuals in this community, my journey, and my blog were exposed. They have been there as I battled through chemo, and listened as I discussed every decision I have had to make since. They have encouraged and celebrated every milestone with me, from my first puffs of hair growth to my first RX’d WOD. I’ve said it before and I’ll say it again, I have already felt blessed by the support and generosity of so many people through this journey: friends, family and strangers. Having to move home for treatment meant I had to pack up my life in London without notice, which was a challenge financially. I am thankful I was able to move back to my family home and be supported by the parents. I’ve never been good at receiving; I prefer to give. Independent Rochelle has been challenged every day to accept support from others. When I was weighing up the cost of having treatment done privately, a friend suggested I start my own ‘crowdfunding’. People crowdfund for a variety of reasons: from starting their own company to IVF treatment. But how could I ask people to support my cancer treatment? I felt that my friends’ have already given so much, and I’m not good at asking. 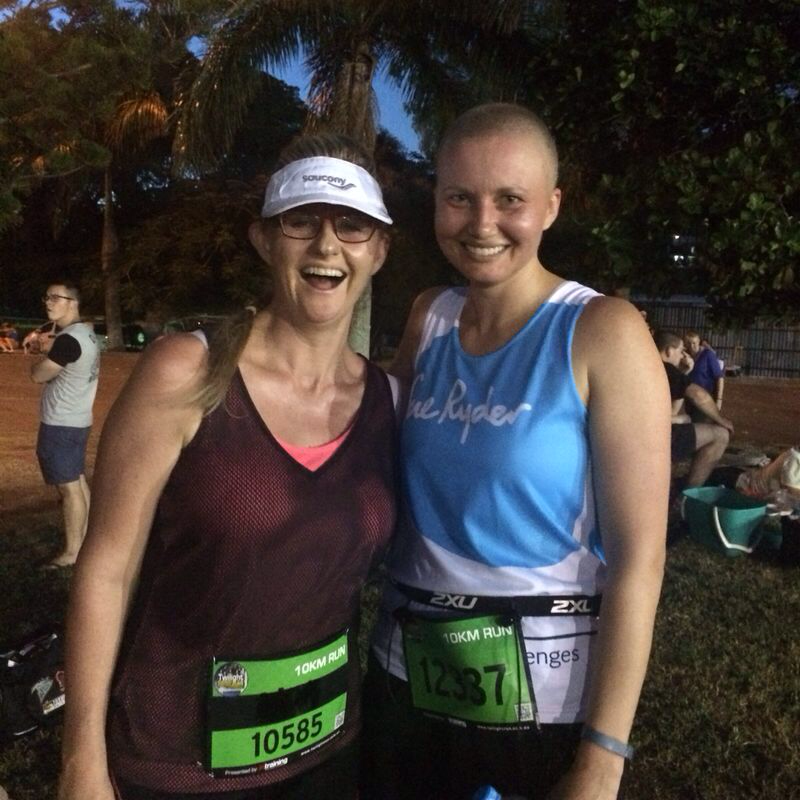 He suggested I set a goal – the half marathon, perhaps – and fundraise to complete it. But most of my friends know I would do that anyway. I considered fundraising for a Breast Cancer Organisation, but again, I struggled with the thought of asking people to give. I would never do well working for a charity. This brings me to the purpose of this blog. A secret group was established and members of my CF have been hatching a plan to fundraise some money to support the cost of my surgery. The cat was let out of the bag and I was finally informed of this the other day. Words cannot express how much this has touched me. And especially as I know how much people have already given this year at other fundraising events at our CF. They have been creative in their approach and have created a month of dares: If you complete the dare, you don’t pay; if you do, the person who has nominated pays $10; and so it continues. 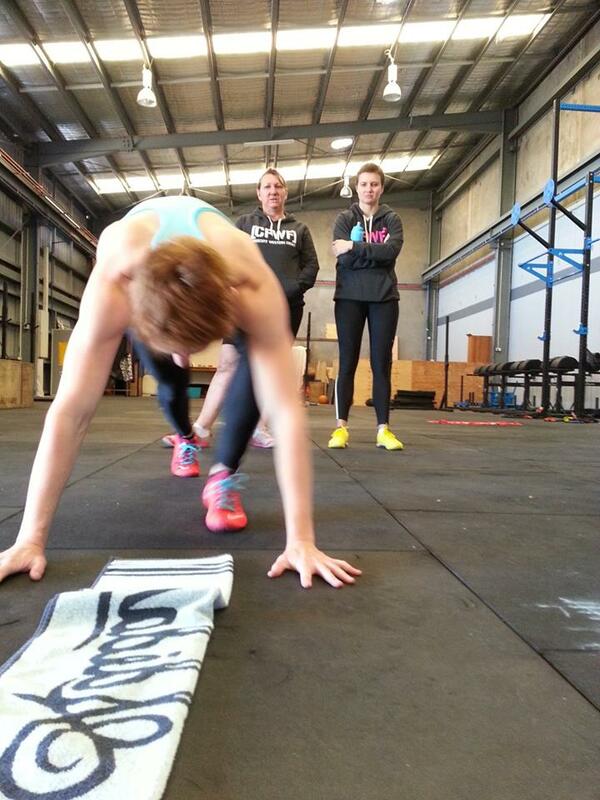 The dares are: complete 200 burpees, WOD in your undies or row 5km. This morning the first victim, Paige, completed 200 burpees. The fact that she completed this dare, while she was sick and after the workout, means just as much as if she had paid $10. The other great thing about this fundraiser is that the dares continue while I am recovering from surgery. I won’t be able to work out, but I will still feel part of the community. Paige completing her 200 burpees. Well here it is, another running story. Most of you know I had a light-bulb moment to enter the Gold Coast Airport Marathon, when I found out my surgery would be after the event. My surgery was confirmed for July 31 and I had eight weeks to train. Eight weeks would surely be enough, right? I was already back running, so I just had to run some more, right? My saving grace came in the form of two people: Mark and Louise. 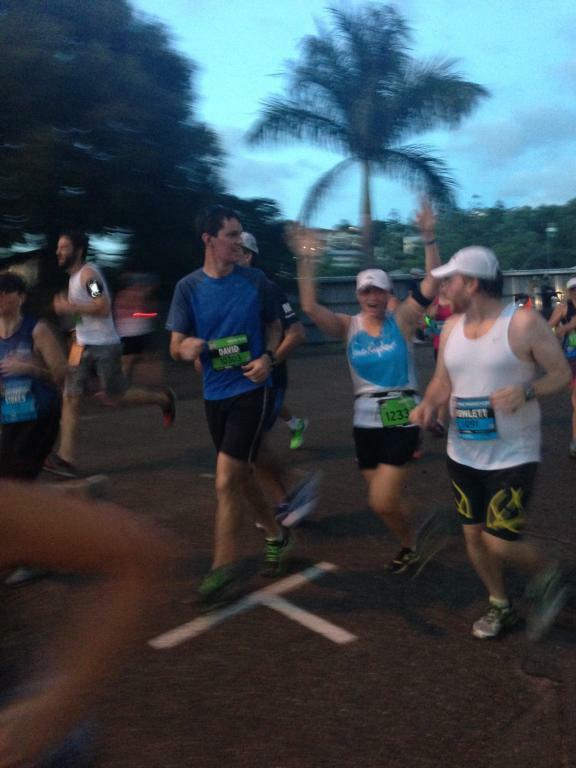 Mark and Louise are training for the Melbourne Marathon and invited me to join them on a morning run. And when I say morning, I mean at ridiculous o’clock! ‘We meet at 5am at the netball courts,’ Mark said. 5AM! If only it was summer and not winter. The first morning, as I approached the netball courts car park, all I could see were red and white lights flashing. These lights were attached to both Mark and Louise. What have I signed up for? They were both kitted out with drink belts, lights, and Mark was wearing a singlet – I was in compression clothing from neck to toes. I felt like such an amateur. The first training run was 10km. I put my head down, ran and was very quiet, unlike Mark and Louise who chatted the whole way. At the end they asked how many weeks until the HM. It was about six. Silence. Let’s just say the next week the distance was increased to 16km! Clearly I was a little behind on a normal HM training schedule. The distance had increased and we were now meeting at 4:30 am. No messing around with these two. Now, most people who train for a race – any distance – usually have one, secret question bubbling inside them: What time will I run? For some people, just to finish is the only goal. But dare I say, the majority of people have a specific time in mind. And everyone – your friends, family and strangers – want to know what that magic number is. For me, taking my training runs into consideration, at an average pace of 5:40-5:50, my goal was 2:00 hrs. I would have to work for it, but it would be achievable. A lot of friends were running in this event, but you never expect to find them in the crowd. With sheer luck, we found one of the girls from the tri club, bonus. It was great to surrounded by familiar faces. It was still early and my stomach was telling me the banana I had eaten earlier was not enough. I debated whether I should eat another. There’s a fine line between eating and drinking too much, or not enough. I still had 30 mins before the start… another banana wouldn’t hurt. The voice over the speaker informed us it was time to get into position. In other words: time for one last toilet stop. With five minutes spare, we raced over to see the runners tightly packed together. We should have known better. It wasn’t a problem squeezing into the crowd; the problem was I was nowhere near the 2:00hr pacer, I was behind the 1:50 pacer. I laughed. No more pacer security blanket, I would have to rely on shiny, new Garmin, and my own intuition. The roar of the crowd signaled that the race had officially started. We were off! And then we weren’t… and then we were … and then we weren’t. Finally, after two minuets of doing the pre-start shuffle, we were actually running. As the spectators cheered, I was overwhelmed with a wave of emotion. I had to hold back tears. Most people cry at the end of a race – I was on the verge of crying at the start. Just crossing the start, I already felt I had won. I thought back to only a few months ago (22 weeks, actually), to the bald woman struggling to run 5km. A half marathon seems like a far-fetched goal. But here I was. Ok. Enough of the soppy, emotional stuff and back to the race… I started to think about the advice given by seasoned half marathon runners: Don’t start out too fast. Ok Rochelle, heed the advice. I looked down and checked my pace, 5:20. Wow! Easy tiger! I told myself to slow down – 5:40 was my comfortable pace. I happily let the runners go past and the 1:50 balloon bounced and fluttered further into the distance. I was going to be smart: I was going to listen to everyone’s advice. The crowd beeped in unison. Or should I say, the Garmin’s beeped in unison – 1km done. I continued to monitor my watch only to see I was moving faster – 5:15. No! I was trying to go slower. Beep – 2km done. The second piece of advice I was given was to have fun. At that moment I looked to my right and we were running past the Broadwater. The rising sun framed the runners’ silhouettes. It was stunning. The image is captured in my mind forever. Beep. Beep. Beep – 4, 5, 6km done. I keep looking at my Garmin, and my Garmin kept telling me I was going too fast. It seemed 5:15 was my new ‘normal’. I felt good and didn’t feel I was pushing myself beyond my limits. Beep. Beep. Beep. Beep – 7, 8, 9 and 10km. There was another strange beep, which I ignored (at the end of the race I realised it was my Garmin telling me I had set a new 10km record). I was still running a 5:15 pace. Ok Rochelle, just run with it (pardon the pun). I gave out some high-fives and yelled to anyone I recognised. I was actually enjoying this. Beep. Beep. Beep. Beep. Beep – 11, 12, 13, 14 and 15km passed and I was going faster! I was now running a 5:08 pace. Yikes. It was either going to end in victory, or very badly. Beep. Beep – 16, and 17km done. I still felt good and was maintaining the same pace. Beep. 18km done. I looked down at my watch and saw the pace had dropped to 5:20. Come on Rochelle, you’re nearly there. 18km – 19km was definitely a challenge. I won’t lie. Do you remember Loony Tunes? Road Runner and Wild E Coyote? I was no longer Road Runner, I had become Wile E Coyote – legs flapping around, not getting anywhere. Beep. 19km. The crowds lined the path, I could hear music in the distance and I finally found the final gear I had been searching for. Beep. 20km. Yes, I was one of those people sprinting after running 20km! Beep. 21km. Beep. First HM. It was done. I didn’t experience an overwhelming flood of emotions, just satisfaction (and shock) with the time I ran. I guzzled down a banana, orange and two bottles of water, and collected my medal and t-shirt. And what do you do after running 21km? Eat everything and anything you can get your hands on. Well, that was my theory. Surely I was allowed. When asked by a friend what I ate to refuel, I replied, ‘A Yatala pie and a PowerAde.’ That was after the coffee and cookie. So what next? A marathon? Absolutely! But not in the near future. Surgery is in a few weeks so I’ll be out of action again. I’ll have to squeeze in a few more long runs before then, maybe another half marathon. The Ipswich Tri Club: for always waiting for me to catch up when running. All my friends and family who have given me constant support and encouragement. And most importantly, to my Wednesday morning running partners – Mark and Louise. There is no doubt in my mind that those 16km runs set me up for success. Firstly: Surgery. I have received the quote and crunched the numbers. It’s on the higher end of my budget but it’s manageable. It is all locked in for July 31st. I have over (just) eight weeks of freedom. Eight weeks to enjoy my mobility. Secondly: Running and fitness. 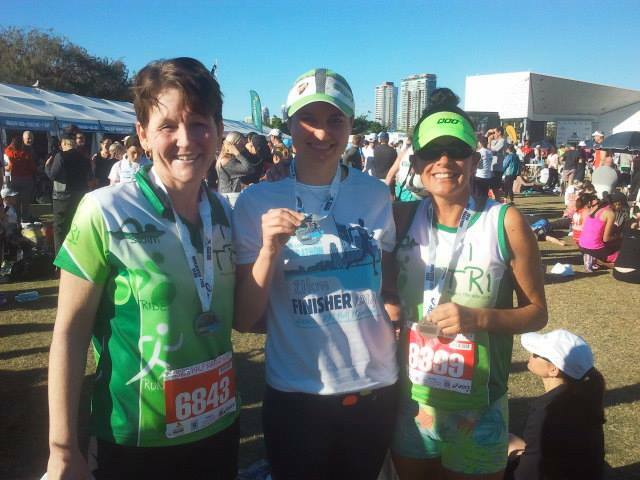 I’ve had a goal to take part in the Gold Coast Half Marathon for many years. I’ve heard it’s one of the best courses for your first HM – it’s flat, very flat. I actually registered about six years ago but it never eventuated. Since being back in Australia it’s been on my radar, although I thought there was zero chance of being able to participate this year. 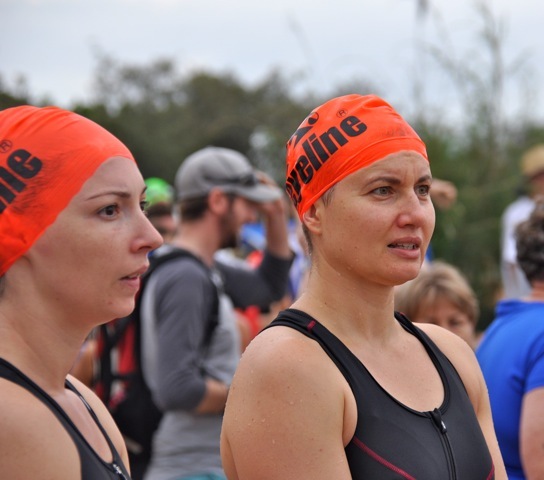 Since my last triathlon I haven’t committed to any events for the rest of the year as that date for surgery was still not confirmed – they could have turned around and booked it in with a few days’ notice. Those on my Facebook know I had a ‘light bulb’ moment when I realised the HM was before July 31st. It’s July 6th. Standby for another running story – sorry. I am also trying to maximise my time at CrossFit to ensure I am in the best possible shape before undergoing major surgery. Thirdly: Hair. I had my first haircut the other day. Exciting. It was starting to resemble and Afro – a dark blonde Afro. My friend Meg did a great job of trimming the back and giving it some shape. I haven’t escaped the “chemo curl” and the hair definitely has a mind of its own in some places. I’m starting to master the art of using hair wax and my brushes have been dusted off and resumed their position in my bathroom draw. Lastly: Study. It continues. I have enrolled in my next unit: Writing Magazine Features. I have also enrolled in Certificate in Professional Editing and Proofreading. The Certificate allows me to work at my own pace so I will be able to take on more study post-surgery when I will be house bound. The other unit is through university and structured over three months. My brain seems to be coping with the workload, for now. I have mentally decided treatment has finished, but on paper it’s a different story. I know I have major surgery to come, but I feel healthy and strong (I’m slowly making gains to where I was before). I am continuing to remain calm and content with the journey. It’s taking longer than I expected, or hoped for. But I am still enjoying life in the meantime. I can’t take credit for anything written below. The article is courtesy of Medivizor – a go-to website for anything medical. When you sign up you give your own personal diagnosis which helps them direct specific and helpful information to you. This analysis examined whether post-diagnosis running and walking differ significantly in their association with breast cancer mortality. Physical activity after the diagnosis of breast cancer has been shown to improve quality of life, physical strength, and significantly reduce symptoms of depression and fatigue associated with cancer diagnosis and treatment. A recent analysis has also demonstrated physical activity to be associated with delayed cancer progression and extended survival. In order to further understand the association between physical activity and cancer mortality, this analysis investigated whether running and walking differ in their effect on breast cancer outcome. This study analyzed the outcomes of 986 women previously diagnosed with breast cancer and participating in frequent physical activity since their diagnosis. 272 frequent runners and 714 frequent walkers were identified. The amount of daily physical activity performed, or energy expended, was expressed in MET-hours (metabolic equivalent of a task). One MET-hour is roughly equivalent to a one kilometer run. During an average follow-up of 9 years, 46 cases of breast cancer mortality were recorded. Among all 986 women, the risk of breast cancer mortality was estimated to be decreased by 23.9% for patients active at least one MET-hour per day. Running was associated with significantly greater reductions in the risk of mortality than walking. Among often runners, the risk of breast cancer mortality was estimated to be decreased by 40.9% per each daily MET-hour of running. Breast cancer mortality was estimated to be reduced by 87.4% for patients participating in 1.8 to 3.6 MET-hours of daily running. Breast cancer mortality was estimated to be reduced by 95.4% for patients participating in more than 3.6 MET-hours of daily running. In contrast, among often walkers, only a non-significant decrease in the risk of breast cancer mortality was estimated for each MET-hour of daily walking. This analysis concluded that post-diagnosis running is associated with increased cancer survival compared to walking. Although a statistically significant association was demonstrated between running and cancer survival, it may be assumed that women participating in frequent physical activity are inherently healthier. This in addition to the small number of breast cancer related mortalities analyzed may have significantly influenced results. I think it’s clear I have a habit of throwing myself in the deep end. Act now; think later. Sink or swim. It’s a common theme in my life. Recently, it’s been clearer than ever: I signed up for the CrossFit open after month’s absence from the gym. I signed up for a 10km run having only run 2 x 5km in a few months. What next? The past few months I’ve kept an eagle eye on the local triathlon schedule. Each month came and went and I was forced to peacefully accept that it wasn’t time to return to my new loved sport. Knowing surgery is weeks, if not months away, I re-visited the triathlon calendar. Hello April. Hello Luke Harrop Memorial. 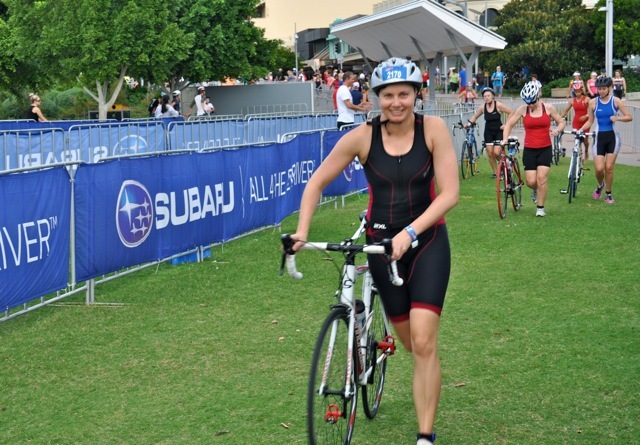 The race is conveniently held on the Gold Coast, an easy commute from Ipswich. Now, I haven’t taken part in any specific triathlon training in the past nine months. I wasn’t allowed in public pools during chemo and I had a self-inflicted cycling ban (incase I fell off and broke something; me, not the bike). The goggles and bike have been collecting dust, literally. Two weeks out from the race I finally committed and registered. I knew I would have to work my way back into things, slowly, so I signed up for the ‘Enticer’ distance. The, as I like to call it, ‘baby distance’. Also commonly known as the ‘fun distance’. It would be crazy of me to jump back into a longer distance race. This would be my tester race; see how the body holds up. 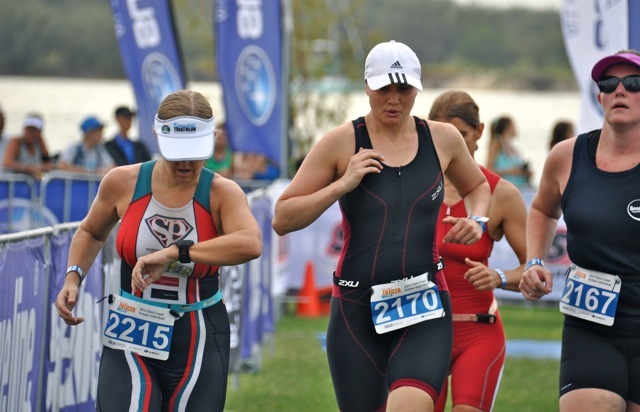 I like to believe in muscle memory – surely the body will remember how a triathlon works and just go along with it. Right? 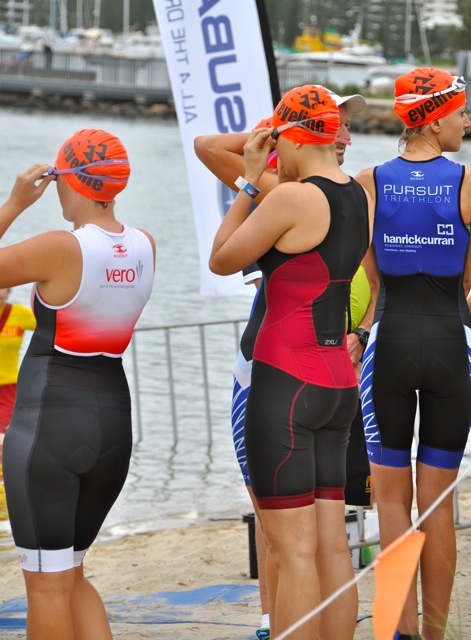 With a bit of time up my sleeve – two weeks – I emailed the head coach of the local Tri Club. I told him I was finally ready to start attending sessions. Two weeks and three training sessions came and went. I managed to get back in the pool and on the bike. It wasn’t enough training to expect a podium finish but enough to regain my confidence. The morning of the race I was more relaxed than I’d ever been before. Even before a longer distance tri. Maybe because my expectations of myself were lower than normal. I hadn’t been training. It was just for fun… Right? The parents and sister came for support. I gave them a tour of the transitions so they knew where to take some snaps and cheer me on. In no time we were heading to the swim start. I jumped in the water and swam some laps to calm my nerves – this was going to be my weakness, it had been nearly nine months since I’ve done any proper swim training. I exited the water and returned to the support crew to wait for the start. The race briefing started and the first wave commenced. Then the orange caps were called to start. That was me. A 300-meter swim would have been fun before, now I was concerned. The starting horn blared and the body propelled forward. No more thinking; just doing. In standard race form there were legs and arms everywhere. It was all coming back to me. Unfortunately it was an uncomfortable swim. I couldn’t get a good rhythm; I couldn’t calm my breathing. But I kept going, one stroke at a time. The exit was in sight. 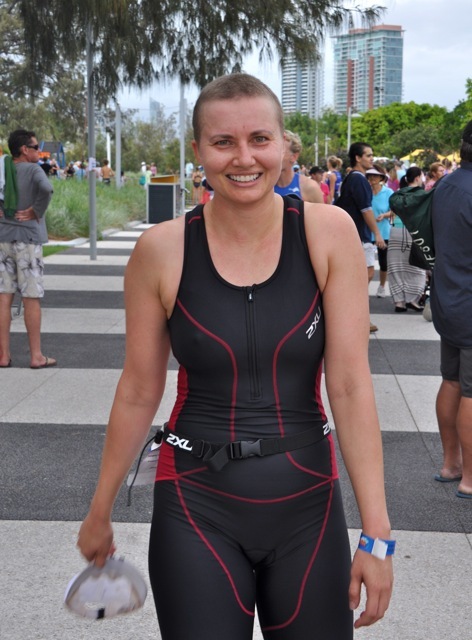 Out of the water and straight into transition – this I remember; this treatment couldn’t have affected. The family missed me coming out of the water as I joked they would have time to relax and grab a coffee while I flapped around in the water. I should have given them a realistic time. It was only 300 meters. I was out in 7 min 44 sec. Thanks to the coaching from my friend Scott while out riding last week, I was comfortable moving through the gears. I managed to keep a good pace. Every time I saw another competitor with standard sports shoes and pedals on their bike I sped up and overtook them – it’s as bad as a Barclay bike rider overtaking you while you’re in your professional cycling gear. It’s not acceptable. They should not be going faster than you. 10km was a breeze. I sped towards the end point and dismounted. A few seconds lost, again, but no embarrassing stacks. Was it fun? Yes. Did it ignite the fire in my belly? Yes. I’m quietly happy it’s near the end of the tri season. A whole year to train and aim for podium finishes next year. I was pleasantly surprised to find out I finished 10th in my category. Top 10. I really can’t complain. 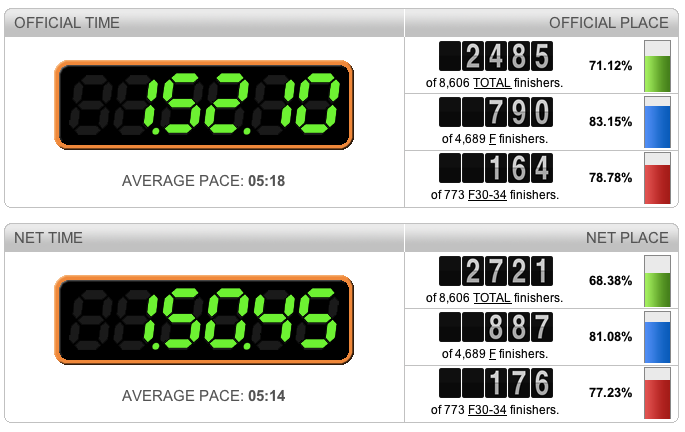 Overall my times were only one to two minutes slower than last year – pre-treatment. I’m confident I’ll gain those minutes back, and more. The morale of this story is that treatment (and cancer) hasn’t ruined my life. It’s given me a new one. New goals. New targets. I have mentally decided treatment is over. I know I still have surgery to come, but I feel healthy and am feeling stronger every day. No more bubble wrap, no more cotton wool. Life is returning to normal. As you know, I’m a sucker for a race. The invisible power of a crowd. You can’t see it but you can feel it. Pushing you beyond your limits. There have been a few races I’ve had my eyes on, but due to not having a set schedule for treatment, I haven’t been able to plan in advance. Twilight Running Festival was one of them. As last week progressed it was clear surgery wasn’t going to happen before Sunday 23rd. Twilight Running Festival was happening Sunday 23rd. This actually suits my personality. Impulsive Rochelle. I jumped straight onto the website. Registrations were available for 3 distances: 5km, 10km and 21km. 5km I know I can do. 10km is the unknown. Thinking back, I can’t actually remember the last time I ran 10km. My Nike running app shows a few 8km runs. I’ve done one 15km, nothing in between. Also, that was all pre-treatment. Was my body up for it now? The decision lingered. A) Stay in my comfort zone? B) Conquer the unknown? Lock in B, Eddy. Of course, if you know me, you’ll also know I like to convince friends to join in my crazy antics. Ask my friend, Nash. He thoroughly enjoyed the Duathlon in the snow and Tough Mudder in the hail and rain. He swore he would never let me convince him to compete in any other event, ever. My Twilight target: Vanessa. She too hasn’t run the distance in a very long time. Of course she would be up for the challenge. The text messages started followed by some Facebook peer-pressure. Success came on Saturday. I now had a 10km buddy. To add to the challenge the race was being held in the afternoon, at ‘twilight’. I have never run in the afternoon or evening before. I’m a morning runner. Roll out of bed, into the shoes and out the door. Apart from being an extremely hot day with temperatures forecast to still be 31 deg, I was looking forward to the foreign running conditions. We arrived at 4pm for a 5pm start. Lucky for us, we had a ready-made support crew and cheer squad. 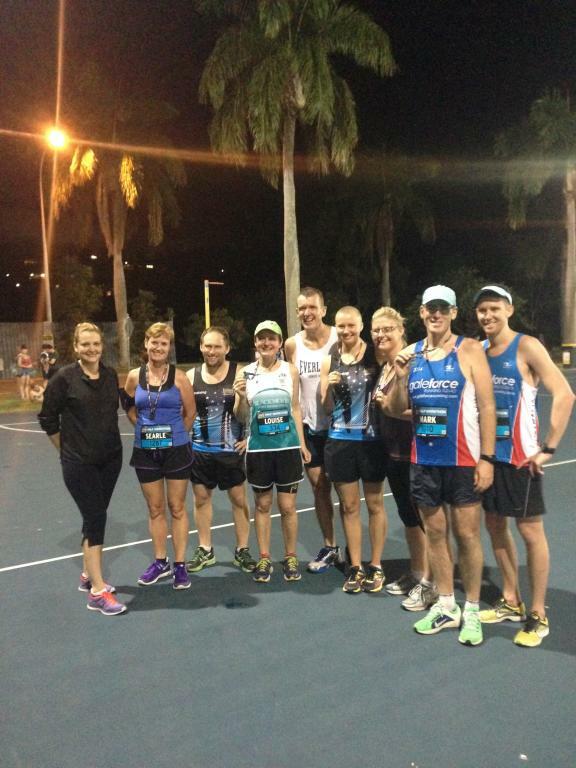 A group of friends from Ipswich were there supporting runners in the 5km and 21km distance. They now had two more to support in the 10km. With 10 minutes to go we maneuvered to the start line. There were a lot of very eager runners and the start line was already overflowing. We squeezed our way through about midway and found a gap in the crowd. Now, preparation has never been my strong point. Clearly. 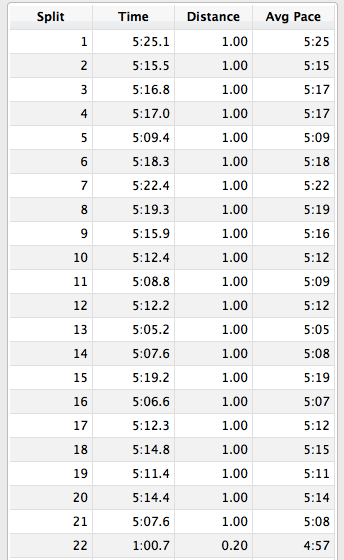 So why would the minutes prior to a 10km race be any different…. With a minute to go I tested my shoes and realised one was slightly looser than the other. Was this going to annoy me? Most definitely! The starting gun sounded and we set off – walking – towards the start. I decided it’s now or never to fix the shoe so made a quick exit to the side. I had already double knotted my laces so it felt like forever to fix the problem. Amateur! Sorted and ready to go I saw Vanessa had sidelined herself so we could start together. Your time is only registered when you cross the start line so I wasn’t losing time by making the adjustments now. Finally, we were off. The crowd surrounding us was setting a good pace. A comfortable pace… I reminded myself this wasn’t my usual 5km distance. I would have to back off otherwise I would run out of steam. My Nike Run app was going to be my saving grace today. It was going to keep me in check. Soon enough I heard my first km split. 5:40. Probably a little too fast, 6 min/km was more achievable for the whole distance. Pre-treatment it would have been a slow pace. But for now, it was comfortable. It was such a stunning course. Starting on the grounds of UQ St Lucia, over a bridge, past the cemetery and along the river. I reminded myself to take in the surroundings and enjoy every step. The km’s ticked over and before I knew it I was nearing 5km. I was already halfway! And I still felt good. By now the runners had reached the turn-around point and heading back towards us. I started to lose focus, I started drifting away with the fairies. I was too focused on trying to find friends in the crowd to cheer them on that I forgot I was in a race myself. When I started to feel dizzy from looking to my right instead of straight ahead, I snapped back to the present. I was having too much fun. 6km came and went, 7km came and went. The km’s were rolling behind me. Then I reached 8km. I felt the struggle in my legs and breath. The pace was slowing; Nike Run was informing me of this. It was hardest km. 9km was in reach and the symbol of the nearing finish line, but it wasn’t close enough. And there was a hill. With a few final strides I made it up the hill and was back on the bridge nearing the final km. I was feeling good again. The sun had set and the final stretch was lined with supporters. Was I supposed to be having so much fun after running for nearly an hour? I thought by now I would have been regretting my decision. I wasn’t. I neared the corner and saw our cheer squad. With all their support and motivation they gave me the final push to sprint towards the finish. Then there were none. No more km. Job done. I made my way to join our crew and learned that Vanessa had crossed not long after me – awesome running by Vanessa, also. It was now time to support the 21km-ers. As I was watching runners push to the end I wondered what their story was. What were they overcoming in this race? What had they overcome to get to this race? Was this also their first 10km? Was this just a warm-up for something bigger to come? Even in our group we all had a story. Achievement comes in all shapes and sizes. With running it is usually determined by times. You can be the fastest or slowest in the race, but there is no doubt in my mind that everyone has overcome challenges to get to the end. Even I was inspired watching other runners. We cheered, we laughed… we talked shop. Most importantly, we created memories. I am beyond excited to now know I can run 10km. The challenge was set and achieved. The next one: 21km. That one I will definitely train for! Surgery will force me to be patient and start from scratch again…but I look forward to what’s to come. Thanks Vanessa for joining me in the run. Thanks to the support crew for the cheers and congratulations. Well done to everyone else who ran. Hopefully everyone has recovered and is feeling good today. So close to the finish line and having so much fun. I think I startled the other runners. The whole crew: 5km-ers, 10km-ers and 21km-ers. United at the end. 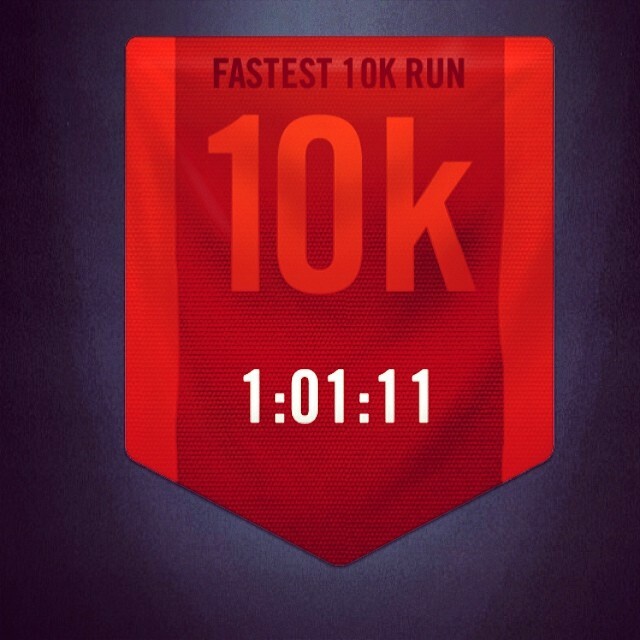 My fastest (and first ever) 10km recorded.